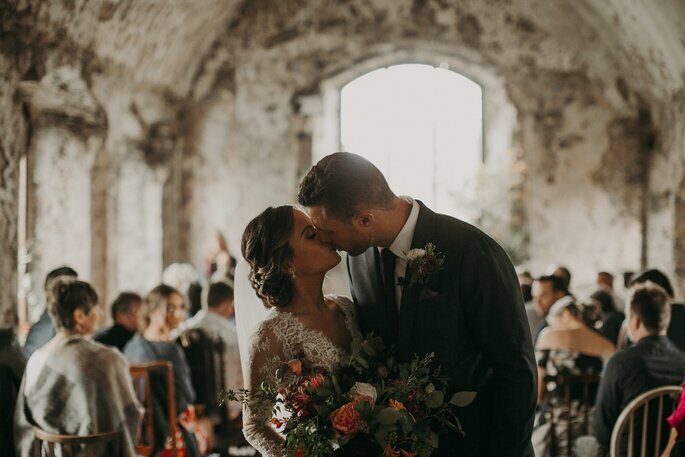 Emily and Jay are a Canadian couple who, before their wedding took place in the beautiful coastal town of Tenby in Wales, had never actually visited the country before. 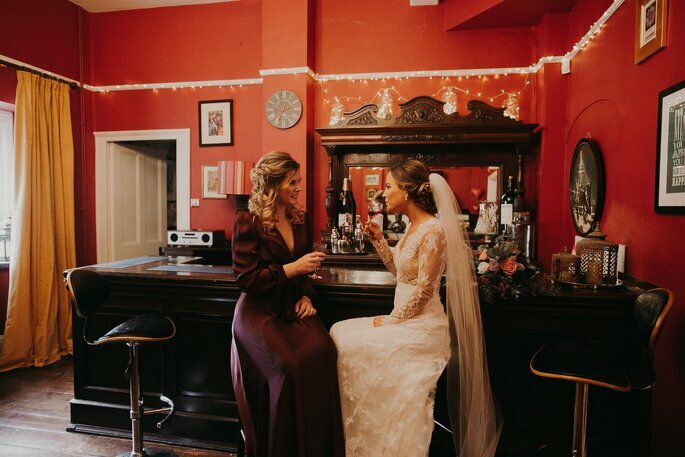 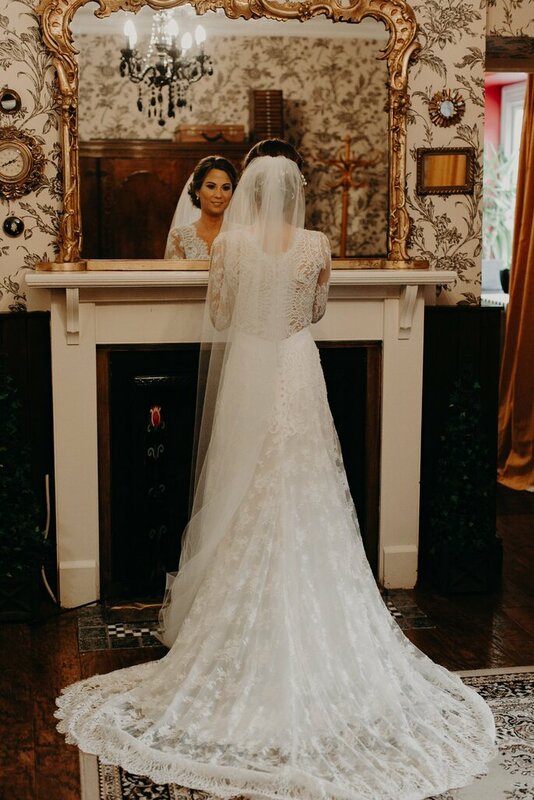 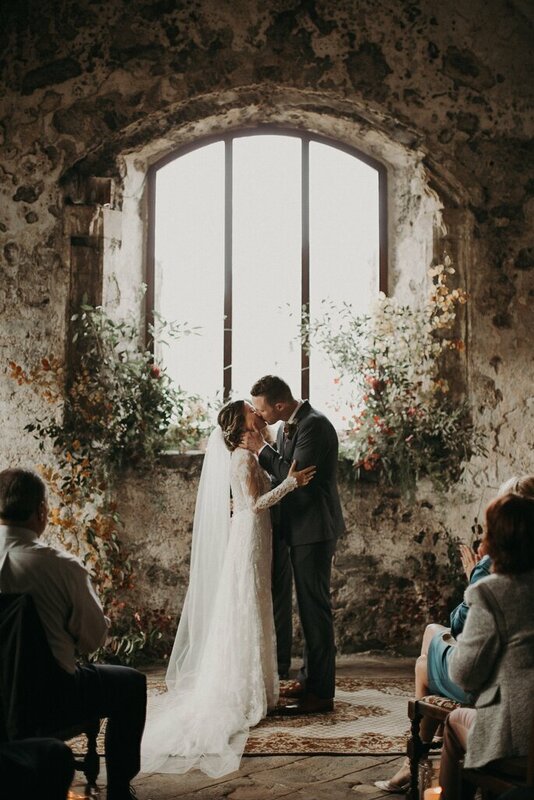 Many couples who travel abroad for their Destination Wedding find themselves in the same boat, but for these two, the choice was deliberate, and imbued with meaning – Emily’s dad was born in North Wales, and so Tenby was selected as a way of honoring him and Emily’s European heritage. 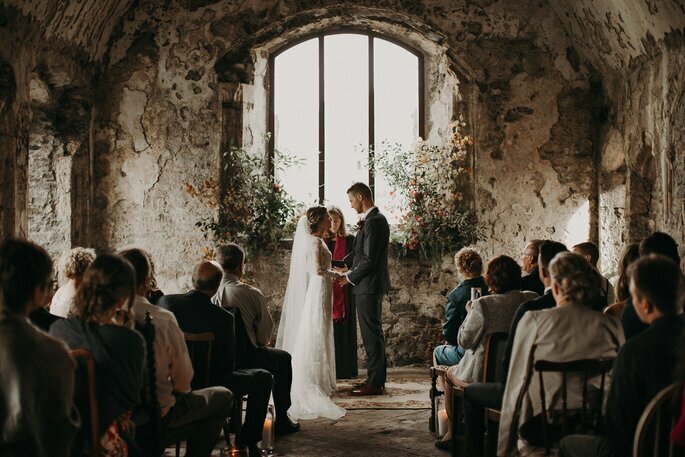 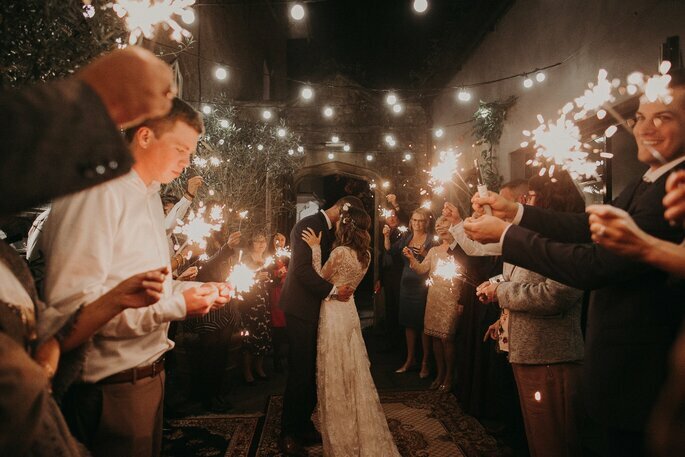 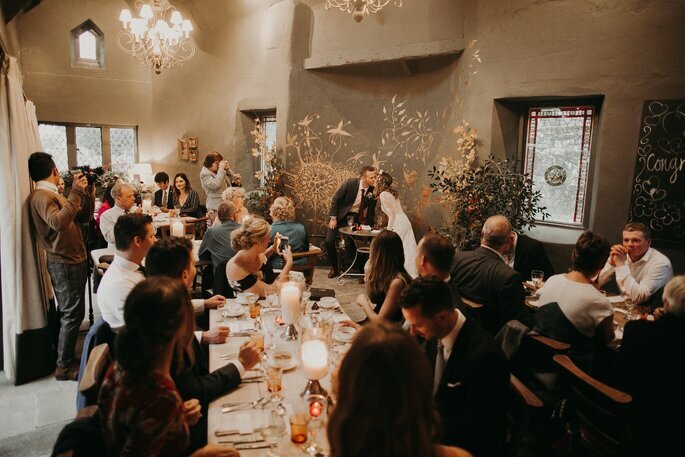 And so, with 30 of their closest family and friends in tow, Emily and Jay tied the knot in an intimate and emotive ceremony in this wondrous corner of the Welsh countryside. 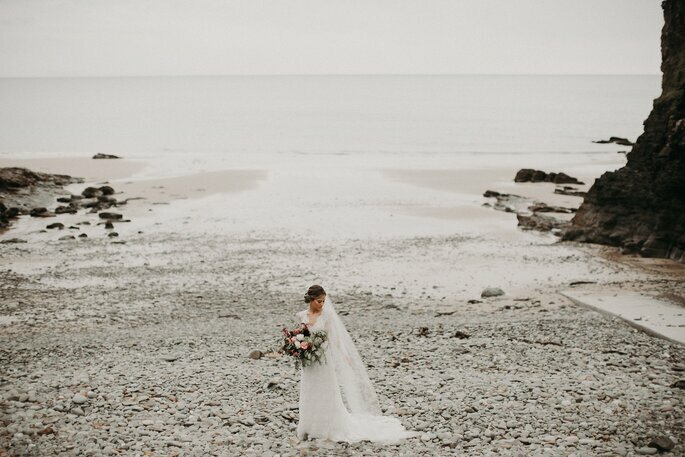 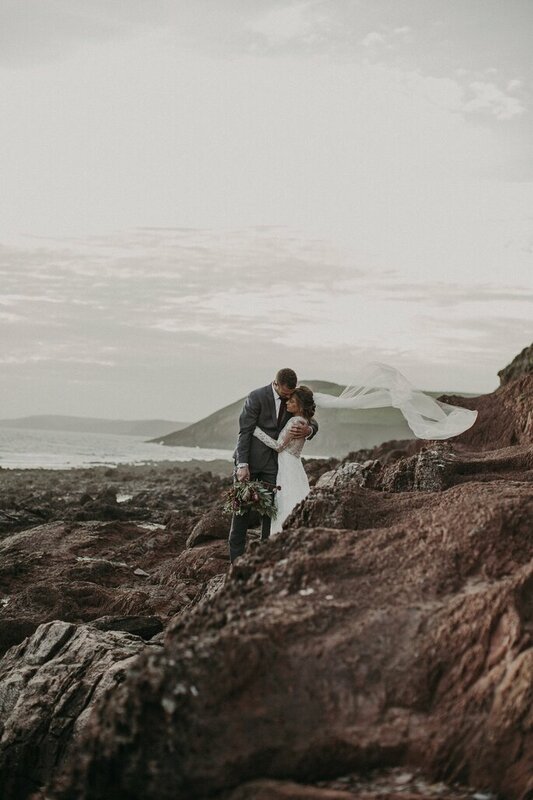 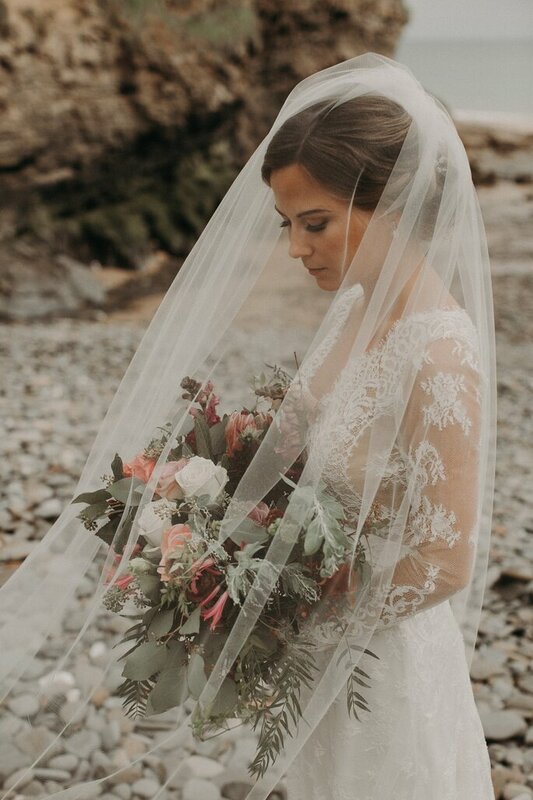 Before their rustic ceremony took place, Emily and her fantastic photographer for the day, Stephanie at From The Daisies – who are based in New York and Colorado – had a breathtaking shoot on the beach at Tenby. 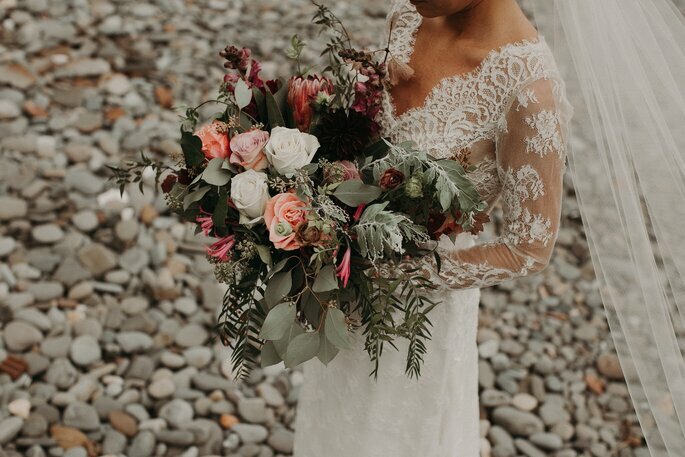 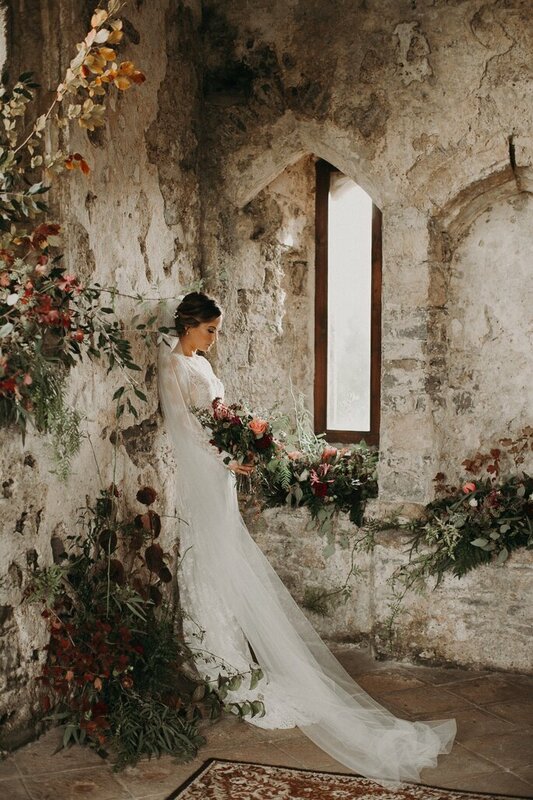 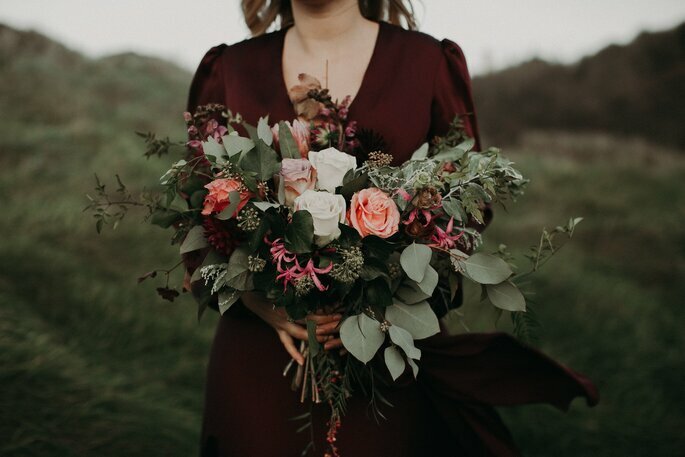 With the coastal breeze creating movement in her veil, these images are absolutely stunning, and show off her gorgeous bouquet with notes of peach, purple and maroon. 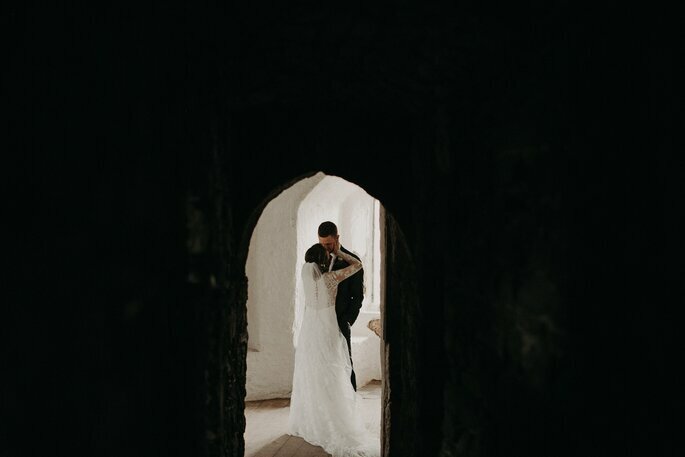 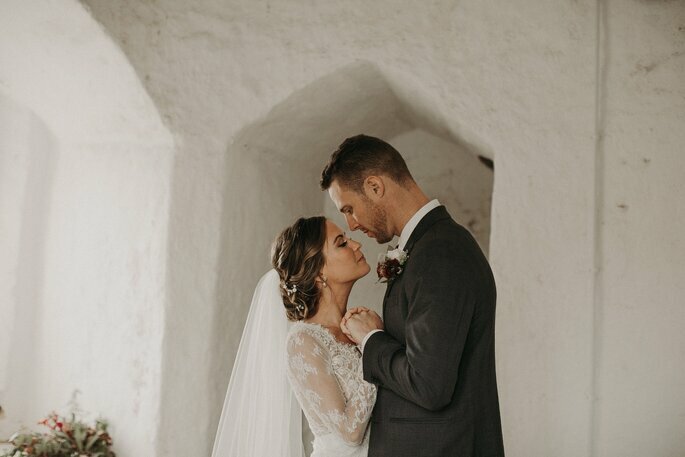 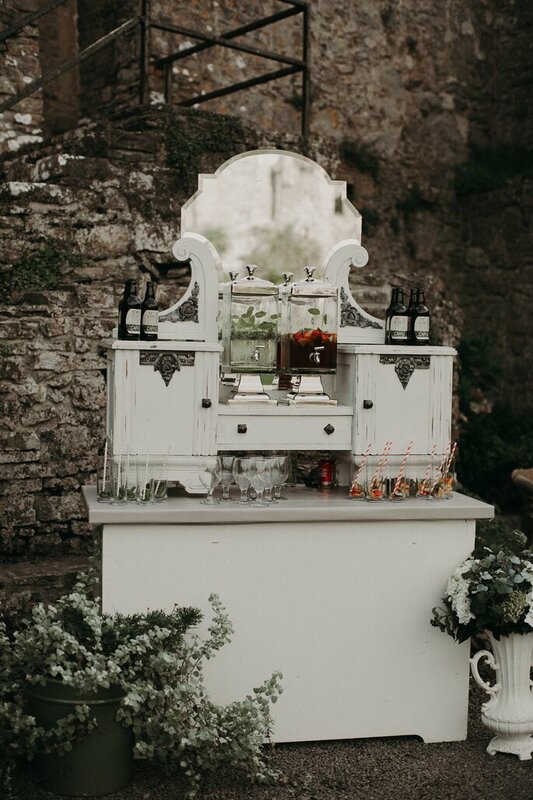 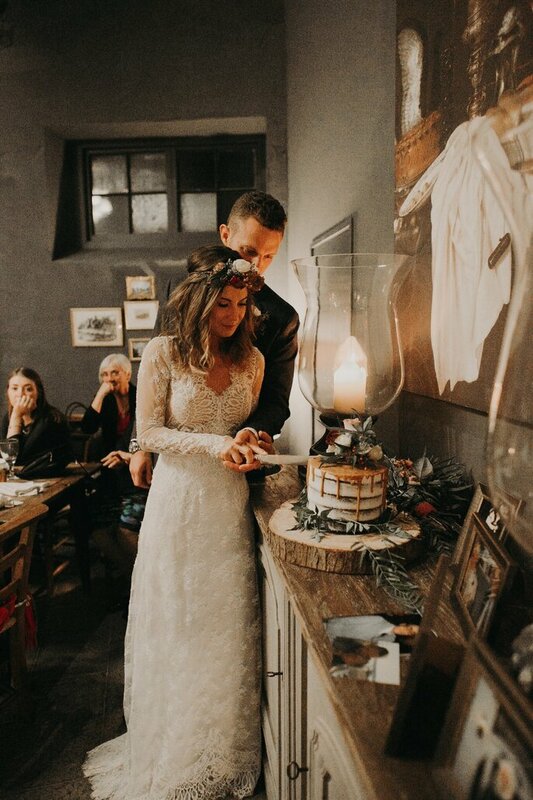 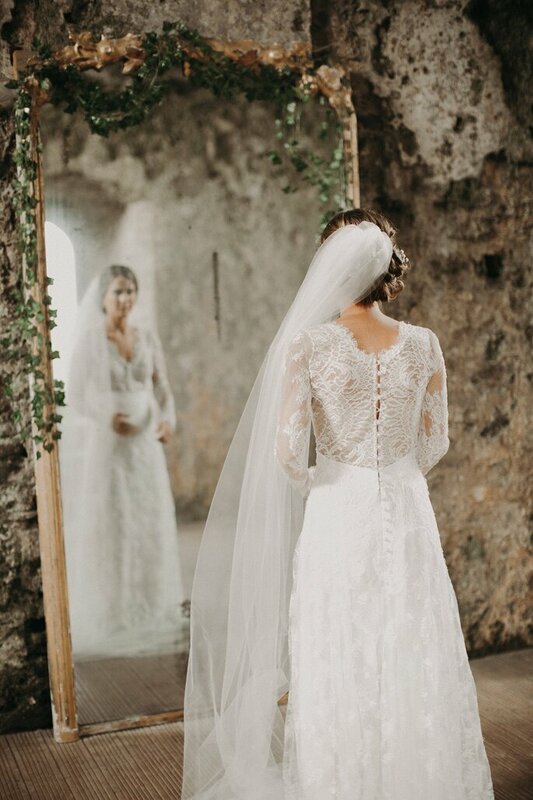 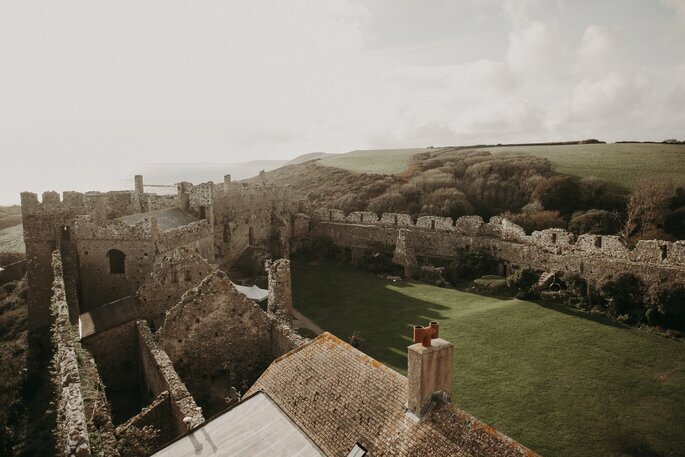 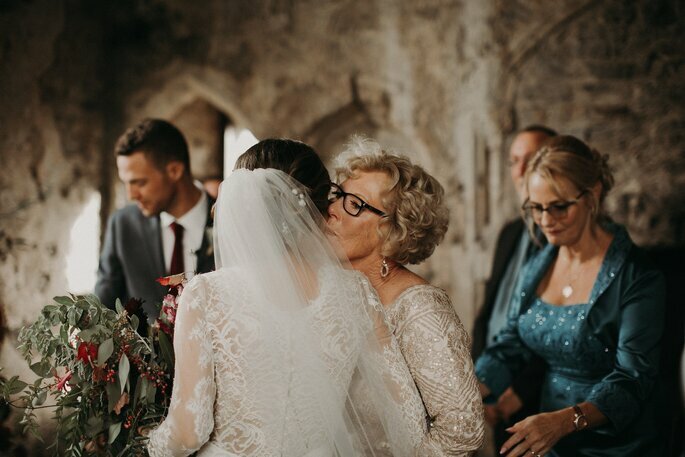 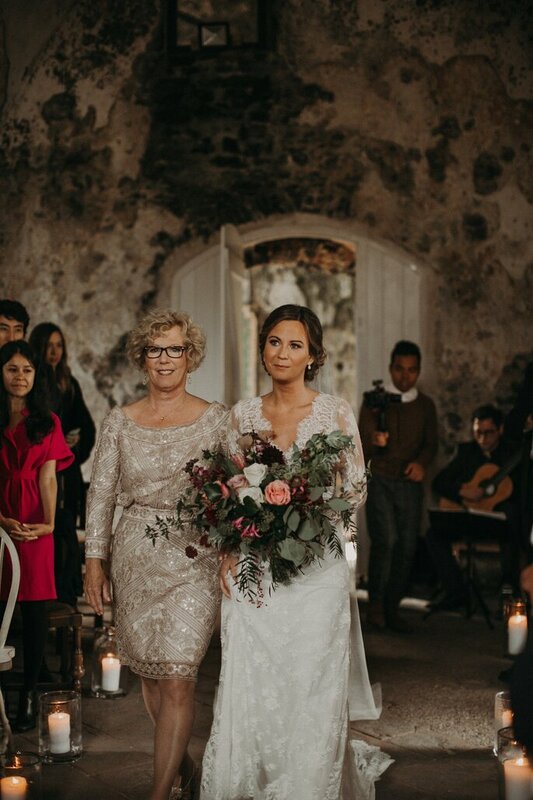 Soon after, Emily travelled to the historic Manorbier Castle, where at the end of the aisle she was reunited with the love of her life. 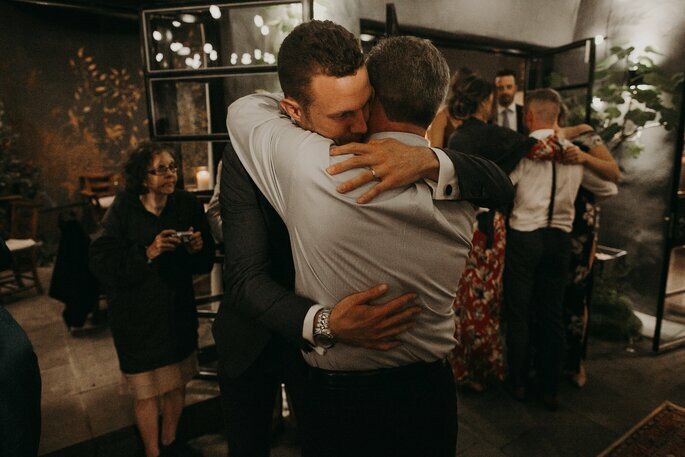 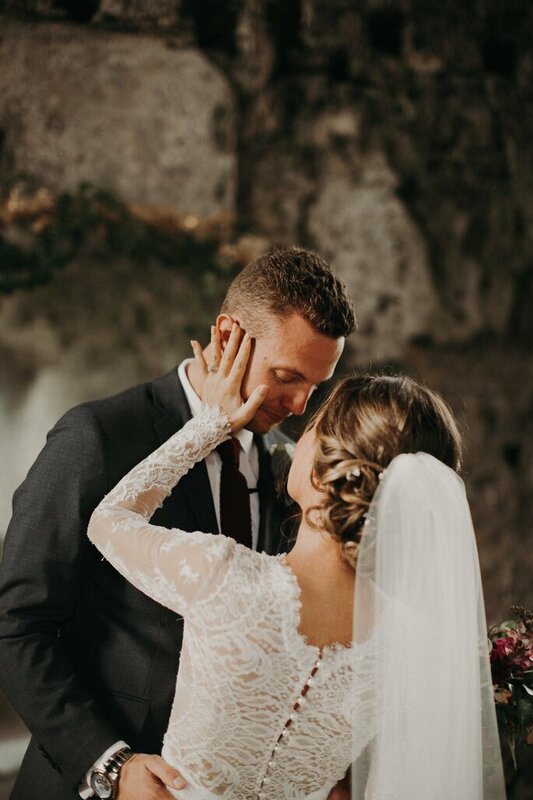 The moment that they exchanged vows was full of tenderness and joy – with not a dry eye present in the venue. 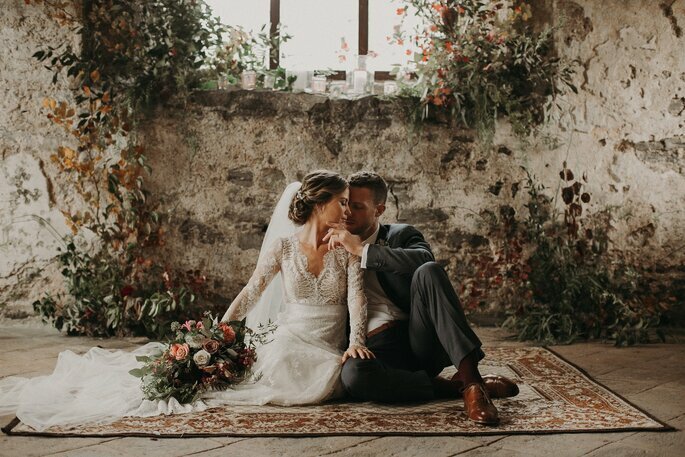 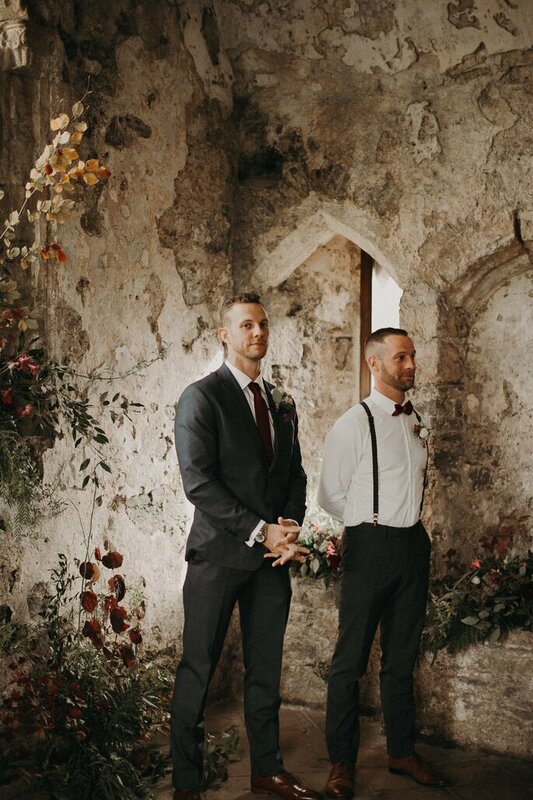 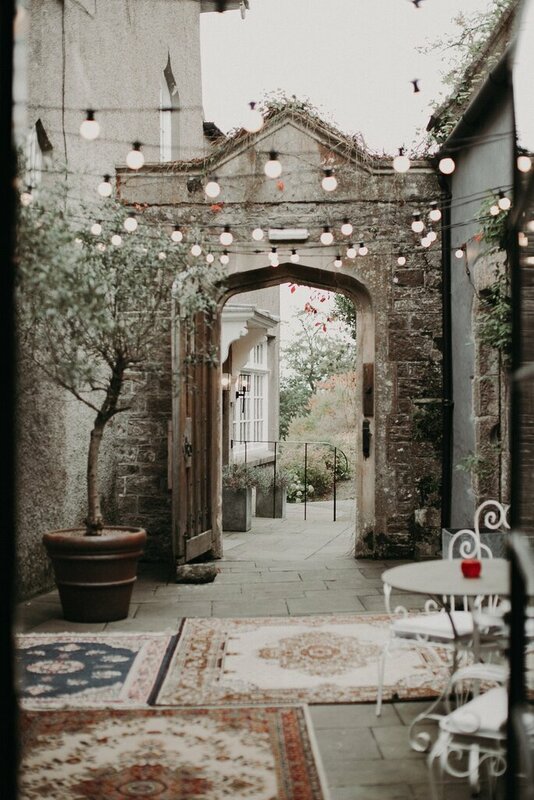 The venue for the newlywed’s reception was the picturesque Penally Abbey, but before they arrived, Emily and Jay enjoyed a lovely couples’ shoot with Stephanie, who captured the immense and profound love between them on camera to be remembered forever. 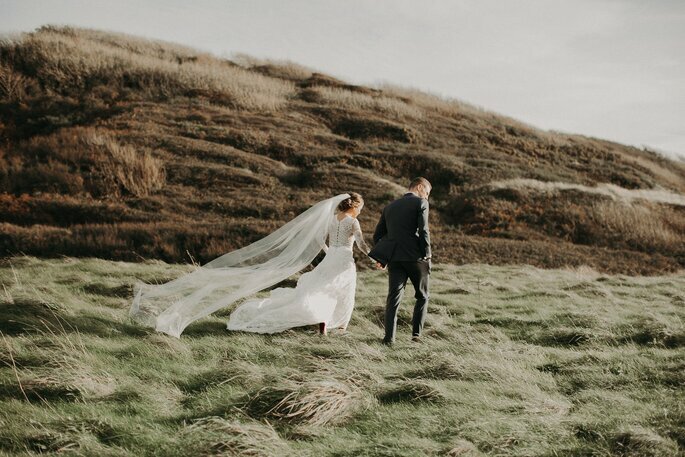 Taking in the Welsh countryside, these photos are brilliant examples of what you could have on your wedding day with the right photographer! 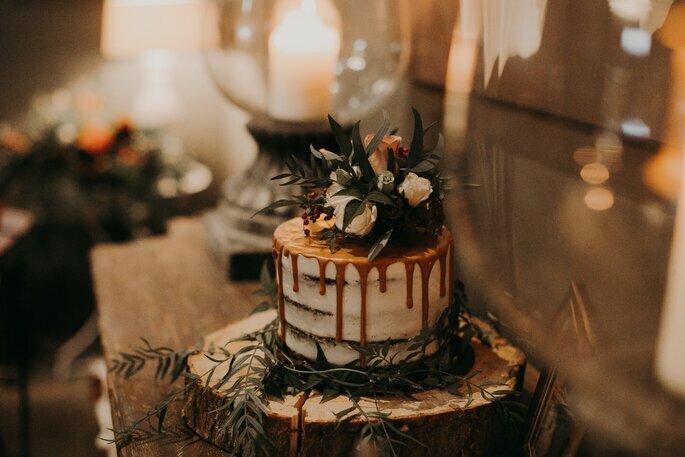 And the reception that followed was equally enjoyable, with a delicious vegan cake, plenty of drinks to go around, and of course, dancing! 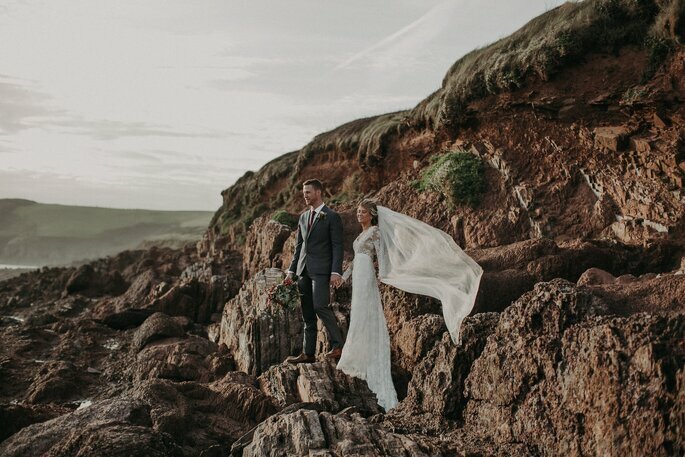 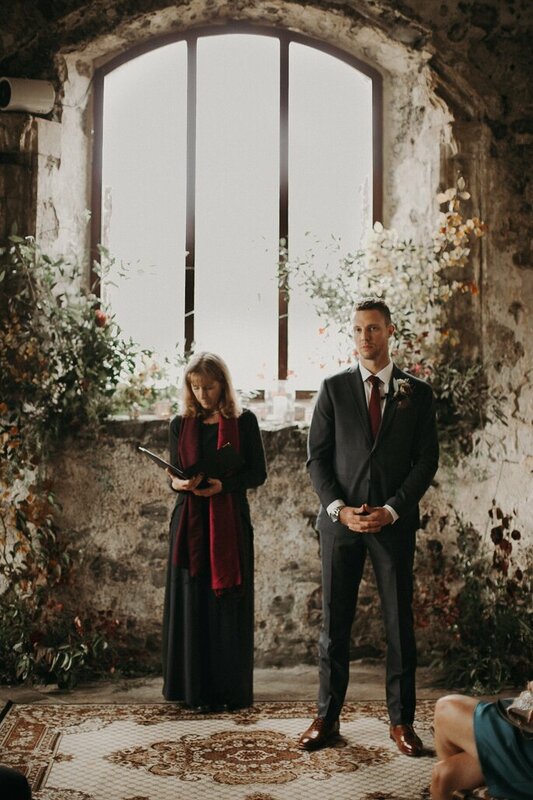 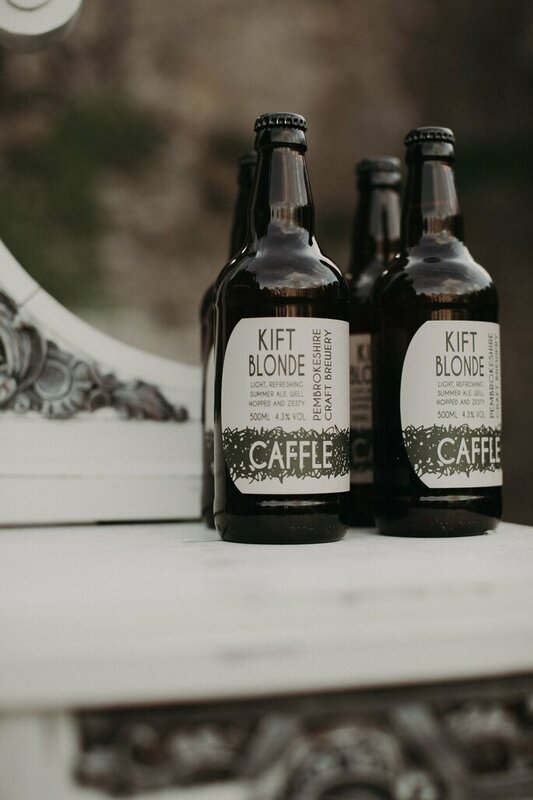 Because they had never been to Wales before, Emily and Jay made the wise choice to hire a local wedding planner to help them make their arrangements. 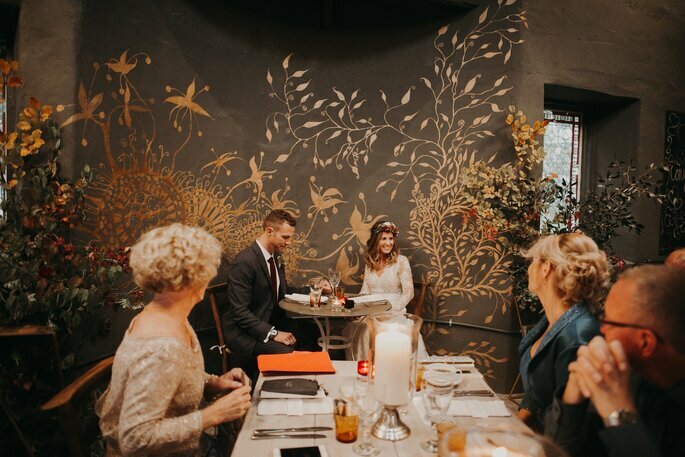 And they chose wisely, turning to Hanna at Just imagine… Weddings & Events for assistance. 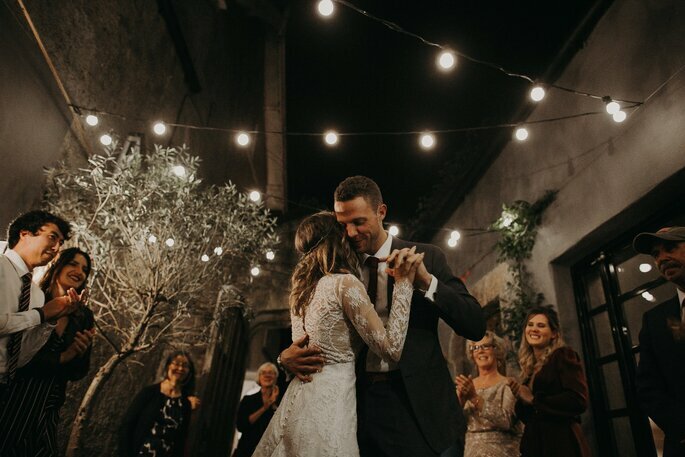 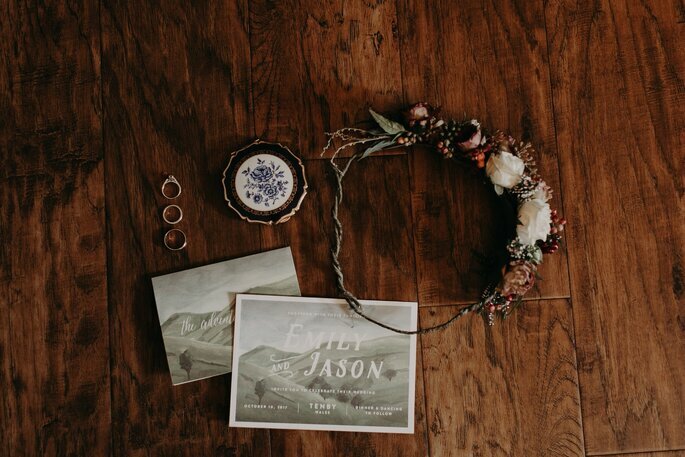 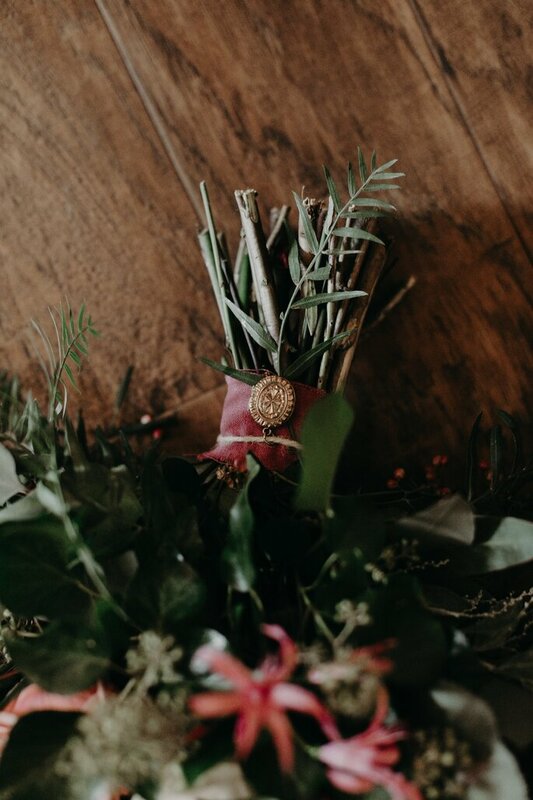 A dab hand at making the most beautiful set-ups look effortless, Hanna ensured that this wonderful wedding went off without a hitch, and found the most treasured venues and vendors to make sure that Emily and Jay’s wedding was not only stylish, but honored Emily’s family too. 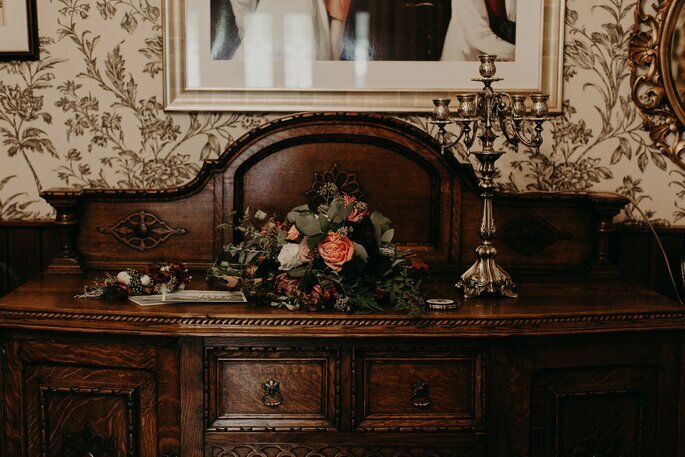 So scroll on and discover it now! 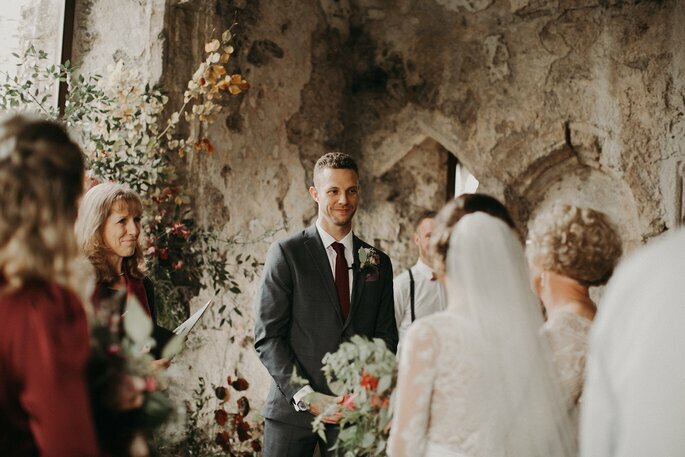 Credits: Wedding planner – Just imagine… Weddings & Events; Photography – From The Daises; Videography – Tu Nguyen Weddings; Wedding venue – Manorbier Castle; Reception venue – Penally Abbey; Florist – Forbesfield; Celebrant – Treasured Ceremonies; Décor hire – Megan & Claude; Hairstylist – Lucie Summerfield Bridal Hair Design; Makeup artist – Jessie Dallimore; Catering – The Fuschia Caffe; Wedding cake – Blanch Bakery; Ceremony guitarist – Timothy Tate; Guest accommodation – Waterwynch.